Teacher Appreciation Day occurs on Tuesday of the first full week of May in the United States. Also known as National Teacher Day, Teacher Appreciation Day is on Tuesday, May 4, 2010. The entire week is known as Teacher Appreciation Week (May 2 - May 8, 2009). Outside the U.S., many other country celebrate Teacher Appreciation every October 5, World Teacher's Day. Typical Teacher Appreciation Day gift ideas include gift certificates, lunch, and gift baskets. 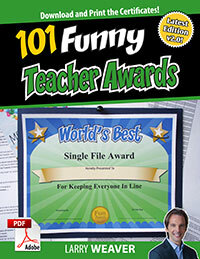 If your teaching staff has a sense of humor, you can always bring a few laughs into your recognition ceremony with Funny Teacher Awards: Your Complete Guide to Organizing a Humorous, Entertaining and Rewarding Teacher Recognition Ceremony. These funny teachers awards are sure to put a smile on everyone's face. Just in time for Teacher Appreciation Day 2010, this PDF book includes everything you need to know to organize an entertaining and rewarding teacher recognition ceremony. You'll get humorous award certificates that are appropriate for everyone around the school, no matter the level of experience or type of class. The PDF includes 76 printable award certificates packaged in a downloadable PDF file that works on a PC or Mac. You can type directly onto the certificates using the latest version of free Adobe Reader software. Print as many as you like on the paper of your choice. Designs are set to work on standard 8.5” x 11” paper. It’s simple and easy to do. Don't forget to celebrate Teacher Appreciation Day 2010 and remember to mark May 3, 2011 on your calendar for Teacher Appreciation Day 2011.